A Packaging Problem Solver Since 1967, ProtoPak Engineering Corporation has specialized in the design of military-spec packaging along with industrial packaging. Our expertise in protective packaging encompasses other marketplaces including manufacturing, automotive, aerospace, transportation and major retailers. Our people, along with their knowledge, skills and experience are the key to our success. We engineer packaging designed in accordance with military spec requirements and industry standards. Complimenting our packaging expertise and experience, we partner with those companies and their products that offer our customers unique value, addressing their particular situation. 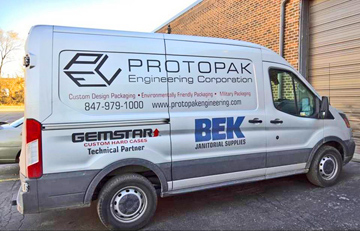 ProtoPak Engineering has all the answers to protecting and packaging goods - with precision. As a 50 year old premier contract packaging provider, we have earned a reputation for designing damage proof packaging in accordance with the United States military. Not only do we exceed MIL-Spec packaging requirements, we also customize packaging for major corporations across the globe. To ensure ultimate packaging protection, we match goods with the precise bags, wraps and boxing materials. It does not matter if the product requires protection from moisture, corrosion, mold, static electricity, aromas, oxygen or even ultraviolet (UV) rays, our engineers will design a reliable, cost-efficient packaging method. Whether it's for the deployment of military goods or a manufacturer's inventory, ProtoPak Engineering delivers packaging services and labeling systems to exceed compliance standards.